So, instead of focusing on the negative, let’s ask a better question: What makes a healthy friendship? 1) A true friend will protect and promote your wholeness. We are complex beings and we need full health: spiritual, mental, physical, emotional. Do you have a friend that wants the best for you in all these things? Do they not only protect it for you, but also promote it? This is the friend that asks if you need to do something to increase your well-being, and also takes steps to help you make that possible. 2) A true friend will point you to God. This might be the most important point, so don’t miss this: Someone can make you feel good, but unless they help you be good, you aren’t getting nourished by the friendship. Isaiah 43:7 tells us that we were created for His glory. So, if you have a friend that believes this also, it will be evident in your relationship. 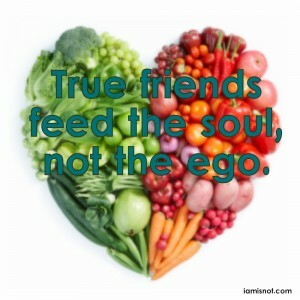 A true friend feeds the soul, not the ego. Do you think I’m funny? Great! God gave me that sense of humor. Do you think I have passion? Don’t praise me, but the God who created that passion in me. True friends feed the soul, not the ego. 3) True friends love you when it isn’t easy. We all have times in the valley. Whatever you call it — a moment, a meltdown, a come-apart — one thing is true: If a friend is around for any length of time, they will witness one of yours. It’s not easy to love in these times, especially if the valley involves the friendship itself. There will come a time of miscommunication, misunderstanding, or even a feeling of betrayal and rejection between friends. You need to decide two things long before this occurs: First, agree to believe the best about the other’s intentions. Second, agree to stick around and work it out. Do you have someone that loves you this much? Hold on tight! When your friend chooses love over anything you choose, that is a rare find. 4) True friends say the tough things. Real love is a courageous love — a love that sometimes looks at you and says, “Hey, why are you doing this?” or “Have you considered doing something different?” or even “I’m concerned about you, friend.” This is perhaps the scariest part of a relationship for both people. For one friend, because they are afraid of hurting feelings and losing the relationship, and for the other because pride tells us to raise our defenses the moment we find ourselves not looking our best. But, here’s the thing: Change doesn’t happen in your comfort zone. Treasure and enjoy the friend that will bring you to a place of both discomfort and growth, yet maintains an atmosphere of safety. What better place to be uncomfortable and grow than with a friend you know will protect and promote your wholeness? 5) A true friend makes themselves available to you. This doesn’t necessarily mean that your friend is able to spend large chunks of time with you or meet you for lunch every week or talk on the phone every time you feel like having a conversation. Life is busy and it doesn’t seem to be slowing down anytime soon! What I mean is a true friend will be accessible — she will respond to your text, or come be by your side in the midst of a crisis, or allow you a front row seat to her life and her struggles. This is the person you can count on to be available in whatever form works best for your relationship. 6) A true friend can give and take. At some point, every friend should be able to give and take one or more of these. It’s normal to have relationships where one friend needs more than the other. It can’t, however, be all give or all take. This reciprocity is also often in different areas. For example, I’m thinking in particular of one special friend of mine who is much more even-keeled than I am. I’m more feeling where she is more thinking. She allows me to process and ask and explore my feelings, taking a lot of her time on occasion. She doesn’t process her feelings the same way I do, so she does not need the same from me. But she does need other things, and I try to offer her everything she asks for that I can provide. Proverbs 27:17 tells us that friends sharpen each other like iron sharpens iron. it’s mutually beneficial. Two people. Give and take. I’m no expert on friendship, and often times I fall short, but I know a good thing when I see it! Dear sisters, treasure and protect those true friendships and seek to be a true friend yourself!